These representatives are elected by locals to oversee the delivery of KNEA programs by the UniServ (or region) to locals and members. The UniServ President serves as a joint supervisor of the KNEA professional staff person (UniServ Director) assigned to that unit along with the KNEA Associate Executive Director in charge of the UniServ program. Delegates from locals all over Kansas attend this annual policy-making meeting. The KNEA Representative Assembly (KNEA RA) approves KNEA Resolutions and to the KNEA Constitution and Bylaws, makes recommendations to the KNEA Board of Directors, and makes recommendations regarding the KNEA budget and dues amount. Each local association is guaranteed at least one representative/delegate. Board members are elected to 3-year terms by all members in each of KNEA’s governance regions. In addition, the Board includes an ethnic minority representative, an educational support personnel representative, a KNEA Retired representative, a KNEA-Student Program representative, a higher education representative, the two KNEA members of the NEA Board of Directors, and the three KNEA Executive officers. The Board is responsible for transacting the business of the Association, implementing policy and program directives of the State RA, proposes and adopts the budget, hires the Executive Director, negotiates salaries with staff, develops policies, proposes and approves changes to bylaws, and proposes changes to the Constitution for State RA approval. The President, Vice President, and Secretary-Treasurer are elected by all KNEA members for a 3-year term (and may serve up to two consecutive terms in a given office). 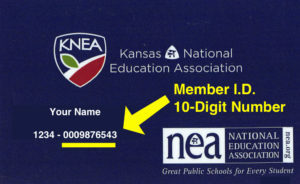 The executive officers, along with an elected member-at-large from the Board of Directors and the Senior Director from Kansas on the NEA Board constitute the KNEA Executive Committee. The executive officers make proposals to the KNEA Board and to the State RA, serve as the official representatives of the Association, make administrative decisions and act on behalf of the Board in the absence of the Board, and work with the executive director to implement KNEA programs and policies. The President and Vice President take leaves of absence from their school districts in order to serve full time on behalf of members. The NEA Board serves as the policy-making body when the NEA RA is not in session. Representatives (based on a membership formula) are elected from each state (Kansas has two) plus additional at-large representatives from ESP, Higher Education, Administrators who serve 3-year terms (two-term limit). Delegates are elected by members in locals, clusters of locals, and state-wide from all states. This policy-making body meets for approximately one week each summer to adopt the NEA Budget, approve resolutions, approve changes to Constitution and Bylaws, and to act on business items regarding programs and policies of the NEA. Executive Committee members are elected by the NEA-RA to serve 3-year terms (two-term limit). There are six at-large positions on the Executive Committee and these individuals have “teaching partners” in their schools so they can be free to serve virtually full-time as needed anywhere across the country on behalf of members and the Association. The President, Vice President, and Secretary/Treasurer are also elected by the NEA RA for 3-year terms (two-term limit). These persons function as the spokespersons for NEA and work with the NEA Executive Director to implement NEA programs and policies.